In December 2015 the fashion store ADLER in Erfurt took over the first robot for automated inventories. TORY became thereby the first RFID inventory robot worldwide to be permanently installed in the retail market. The robot has been in operation for a year now. TORY was developed by the company MetraLabs GmbH, the specialist for mobile service robots. The RFID inventory robot TORY from MetraLabs GmbH celebrates its one-year anniversary at the fashion store ADLER in Erfurt. TORY is the first RFID inventory robot in the world to be used in practice (watch YouTube video). It is one of the most advanced mobile service robots on the global market. TORY records goods via RFID or NFC with an above-average ratio of 99%. In addition, TORY can also be used as a shopping assistant, that guides customers to sought articles and advises them on shopping. Equipped with the company-specific navigation software of MetraLabs, TORY moves completely autonomously and also avoids unexpected obstacles. Roland Leitz, the authorized signatory and IT division manager at Adler Modemärkte AG, has accompanied the introduction of the robot at ADLER from the outset: “We are extremely satisfied with the results. TORY records ADLER’s inventories autonomously, more reliably and more regularly than the employees in the market are able to do it. “Since his first working day on December 1, 2015, TORY has traveled approximately 400 km and scanned more than 5 million articles. The average acquisition rate was over 99.5%. During the course of the year, ADLER expanded its range of operations with other TORYs to other branches. In the meantime, several robots are on the way in Adler Stores in Haibach, Rüsselsheim, Mutterstadt and Limburg. The employees in the markets look forward to the energetic support of TORY. “Inventory was rather an annoying task.”The robot is a good tool for us,” says Heidi Scheeder, an employee at the Adler Modemarkt in Erfurt, to an MDR reporter (see the whole article). The working world will change greatly in the future thanks to the new technologies. How this work 4.0 will look like is still open. But TORY already provides a successful example of how cooperation between man and machine can be achieved. The robot does not replace employees but relieves them of time-intensive and less productive tasks. This gives them more time for the customers and ensures an efficient division of labor. This is the idea behind TORY. The developers at MetraLabs work for a future in which humans and robots share their workspace and complement each other. MetraLabs is a specialist in mobile robotics with many years of experience. 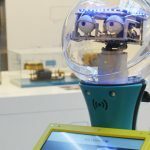 In 2007, the company launched the first interactive shopping robot of the world, awarded the Thuringian Research Prize. Since then, over 250 robots have been installed in various applications worldwide, which now have more than 70,000 km of driving experience. MetraLabs already implemented many different applications for service robots. In restaurants, nursing homes, museums, shopping malls, retail stores, in cleanrooms and industry. They interact and communicate with people and, with the help of MetraLabs’ highly developed and highly-tested navigation software, they drive completely autonomous and secure even in dynamic environments. For the future, MetraLabs is planning further applications in the field of mobile service robots. The latest developments are in the area of automated out of stock recognition, planogram analysis and floor cleaning. The TORY RFID inventory robot is also to be continually developed further. This is how CEO and co-founder of MetraLabs, Johannes Trabert, can imagine expanding the interaction functions of TORY so that shopping becomes even more an experience for the customer.